The hair on our head (or lack of it) forms a huge part of our cultural identity and is one of the very first things that people will notice about us. We praise the coiffure moments where the fresh hair cut, blow dry or style transforms us, making us feel ready for anything. We see thousands of adverts featuring polished men and women smiling ecstatically whilst running their hands through enviably thick and glossy hair. We go to an art gallery and are exposed to a mass of historical figures surrounded by luscious locks. We are in awe, experiencing pangs of hair envy as we go about our daily lives. So what happens when our beloved hair follicles start to diminish due to ageing, illness or stress? 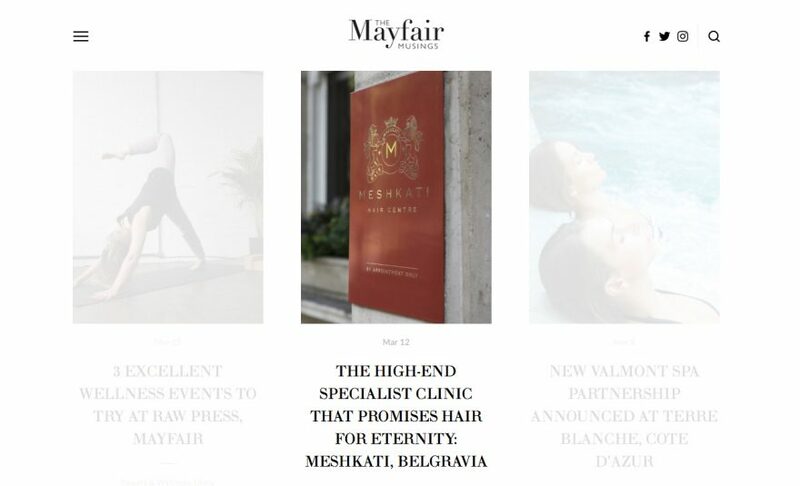 10 Grosvenor Place in Belgravia is home to MESHKATI, an innovative, high-end hair centre. MESHKATI employs a team of leading hair specialists and researchers to provide discreet, advanced and bespoke solutions to hair loss. Founder Amy Meshkati has acquired more than 30 years of expertise in hair restoration and research, providing an artistic and aesthetic touch to each intervention. MESHKATI’s aim is to create truly beautiful and natural hair. The centre’s two most popular hair restoration procedures, NANOPROCEDURE and ULTRACONNEXE, are 100% natural and non-surgical. They can restore hair and miraculously reach any desired density, regardless of the extent of the hair loss. Thanks to a detailed hair analysis MESHKATI named « DNA-MATCHED », samples of the patient’s hair are examined to assess different factors including physiological, chemical and electrical properties, texture, colour, degree of waviness and thickness, as well as resistance to biological agents. On the basis of this analysis, substitution hair is carefully selected from MESHKATI’s extensive hair bank, matching the existing hair with natural donor hair as closely as possible. The substitution hair is then carefully distributed by a specialist between the patient’s existing hair onto the patient’s using the most adapted procedure (either surgical or non-surgical). MESHKATI offers specialist treatment for hair loss caused by chemotherapy. CHEMOSOFT is a unique hair replacement solution designed to restore cancer patients’ confidence and to help them focus on recovery. Painless, nonsurgical and natural, this procedure provides a soft and discrete solution to hair loss during the course of chemotherapy. Unlike wigs or weaves, this exclusive method is comfortably fixed for the entire duration of the treatment and until the natural hair grows back to your desired length. With CHEMOSOFT, you can wash and color your hair, feel your scalp and run your hands through your hair, swim, exercise and sleep comfortably, without any concern for your hair. Every MESHKATI procedure is available for both men and women suffering from hair loss or thinning hair. By providing solutions to your specific needs, MESHKATI is able to offer you with instantaneous and lasting results. You can rest assured that MESHKATI is the perfect solution to restoring both your hair and your confidence!